Well lets see, if the state didn't see Travis as a Public Health Risk, then why didn't the police officers try to handle Travis in the intersection when he wouldn't get back into the car for hours? Perhaps because they were afraid of him? If, this being the case then that would mean that they KNEW that he was a public Health Risk wouldn't it? Why didn't the police officers just call the SPCA (as with other lose animals), and have them restrain the animal? I know, because they all knew that NO ONE would be able to restrain him, capture him, or put him in a cage. His owner, Sandra Herold couldn't even handle him. If she could have handled him she would have gotten him right back into the car immediately! That's clear evidence that he WAS a danger. Stupid, stupid stupid. Once again it's all about the money isn't it? If they found Sandra guilty of this, the state would be holding themselves for future liability. Why can't they just be people and think if this had happened to their wife, their daughter, their mother, and what would they want for them? Where is the justice for the innocent and the victim, Charla Nash? This whole situation really stinks!!!!!!!!!!!!!! Sandy Herold, the owner of a 200-pound chimpanzee that viciously mauled her friend Charla Nash "welcomed" the state's decision not to criminally charge her in relation to the attack, her lawyer told ABC News. 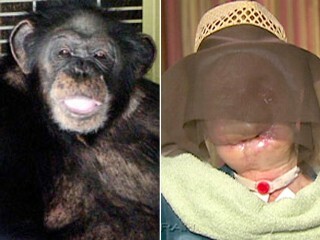 Charla Nash, right, was attacked by her friend's 200-pound chimpanzee named Travis, shown left. Connecticutt officials announced Dec. 7, 2009 that they would not file charges against the chimps owner, Sandra Herold. "The State did not perceive Travis [the chimpanzee] to be a public health risk prior to this incident occurring," Herold's attorney Robert Golger said in a statement. "His attack on Charla Nash was not foreseeable to Sandy." Though an attorney for the Nash family said the family "understands" the state's decision, they have filed a $50 million civil lawsuit against Herold and want to sue the state for $150 million. Connecticut State attorney David Cohen called the attack that left Nash blind and grotesquely disfigured a "horror" and said the facts were "uncontroverted." But he declined to press charges against Herold, saying Herold had not acted recklessly when she asked Nash to help cage Travis because the animal had never previously attacked anyone. Click here to see Charla Nash's uncovered face. "Additionally, there is no record of the State Department of Environmental Protection warning Mrs. Herold in any way that the animal could be dangerous and pose a threat to people," he said. Cohen said investigators who conducted a necropsy found no signs of illness, but did find trace elements of the anti-anxiety medication Xanax. At the time of the attack Herold said she gave the ape some of the pills in a teacup, but later withdrew that comment. The chimpanzee attacked Nash in February when Herold asked her friend and an employee in her home-based towing company to help lure the animal back into its room-sized cage. Herold kept the ape in her home and regularly ate meals with the animal seated at her dining table.